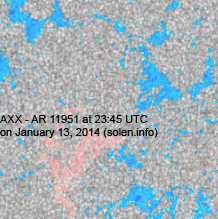 Last major update issued on January 14, 2014 at 05:45 UTC. 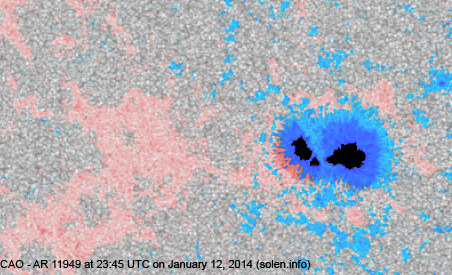 The geomagnetic field was quiet to unsettled on January 13. 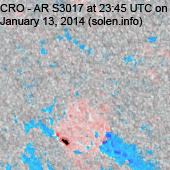 Solar wind speed at SOHO ranged between 524 and 763 km/s under the influence of a high speed stream from CH599. 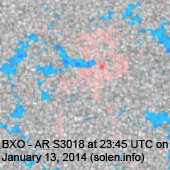 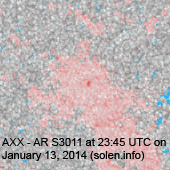 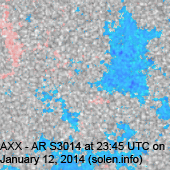 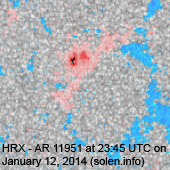 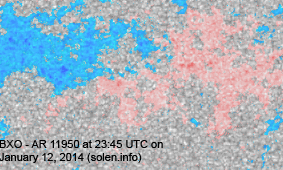 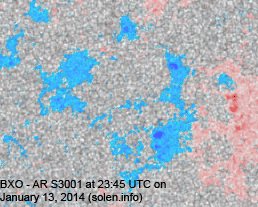 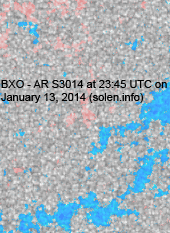 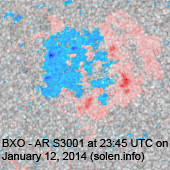 Solar flux at 20h UTC on 2.8 GHz was 143.3 (decreasing 15.7 over the last solar rotation). 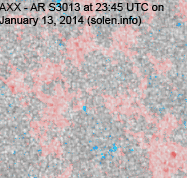 The 90 day 10.7 flux at 1 AU was 148.8. 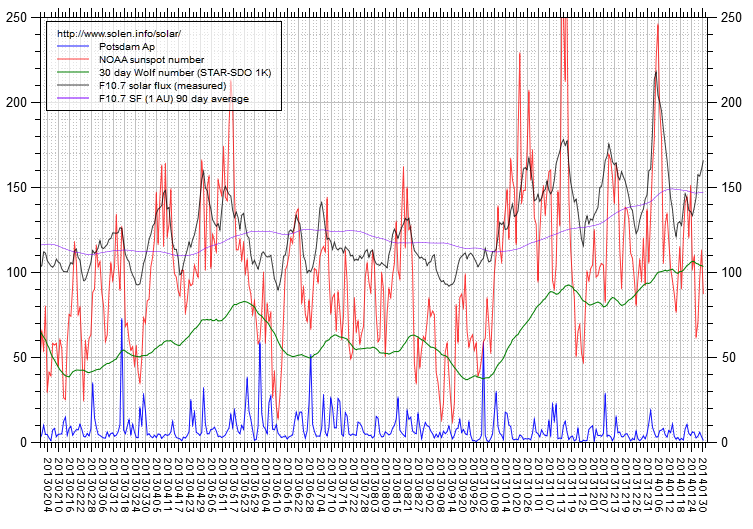 The Potsdam WDC planetary A index was 6 (STAR Ap - based on the mean of three hour interval ap indices: 6.4). 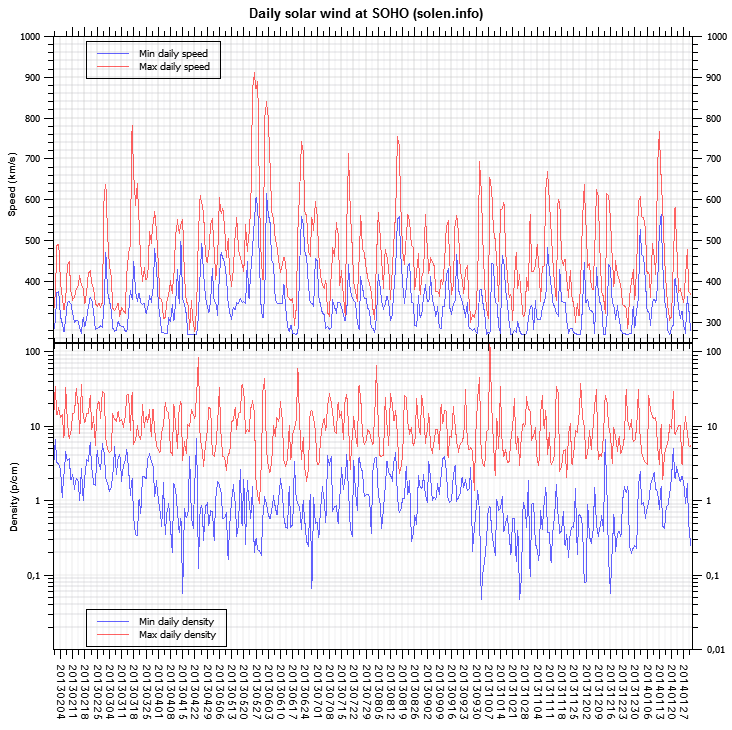 Three hour interval K indices: 23211112 (planetary), 22211211 (Boulder). 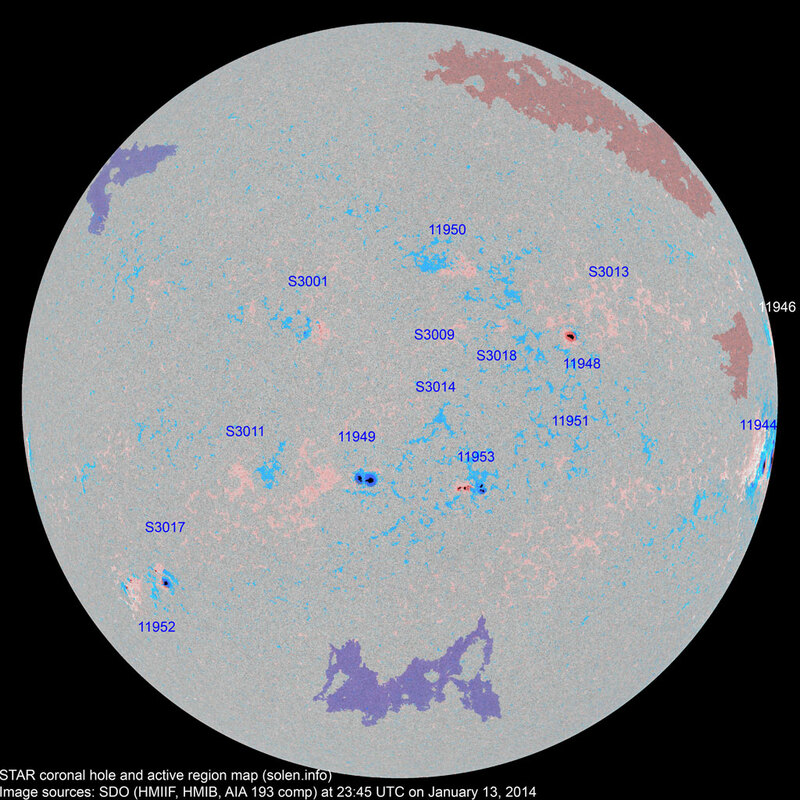 At the time of counting spots (see image time) spots were observed in 15 active regions in 2K resolution (SN: 252) and 13 active regions in 1K resolution (SN: 183) SDO images on the visible solar disk. 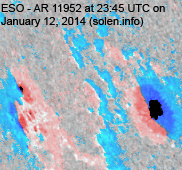 Region 11944 [S10W82] rotated to the southwest limb and still has the potential to produce a major flare. 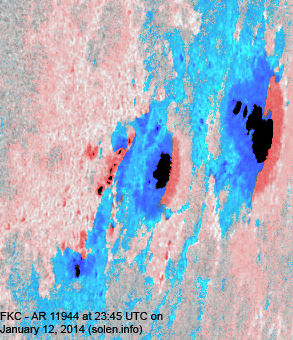 C5+ flare: impulsive M1.3 at 21:51 UTC. 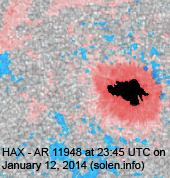 Region 11946 [N08W82] decayed further with only a penumbra spot visible near the northwest limb. 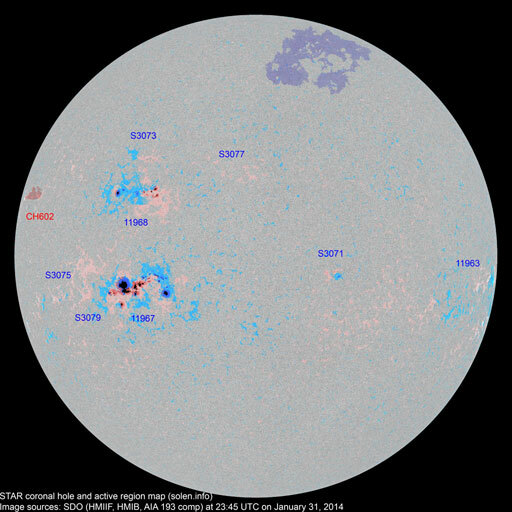 Region 11948 [N05W27] decayed slowly and quietly. 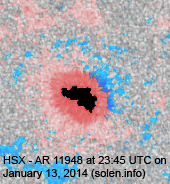 Region 11949 [S17E07] was quiet and stable. 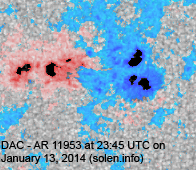 Region 11950 [N16W10] decayed in the trailing spot section and gained leading polarity penumbra spots. 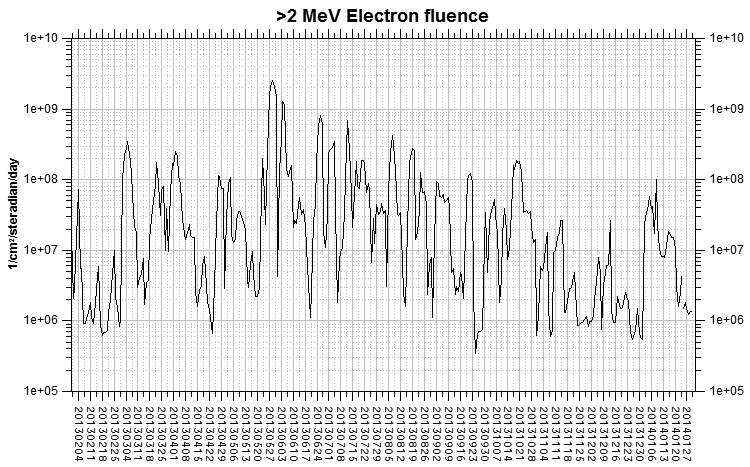 Region 11952 [S32E49] decayed slowly and quietly. 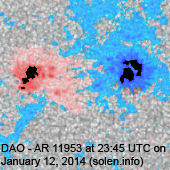 Region 11953 [S18W12] became a compact region and there's a chance of C flares. 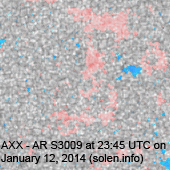 S3001 [N07E13] was quiet and stable. 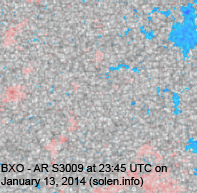 S3009 [N10W07] was quiet and stable. 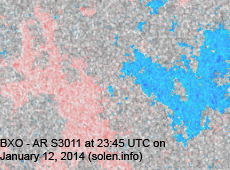 S3011 [S15E26] was quiet and stable. 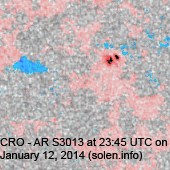 S3014 [S08W03] was quiet and stable. 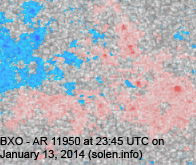 New region S3017 [S30E47] emerged very close to the leader spot in AR 11952. 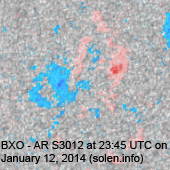 The proximity of the regions could cause flare activity. 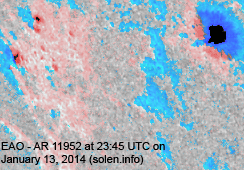 New region S3018 [N07W16] emerged with penumbra spots. 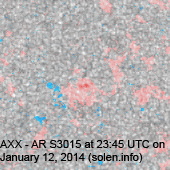 New region S3019 [S13W27] emerged with penumbra spots. 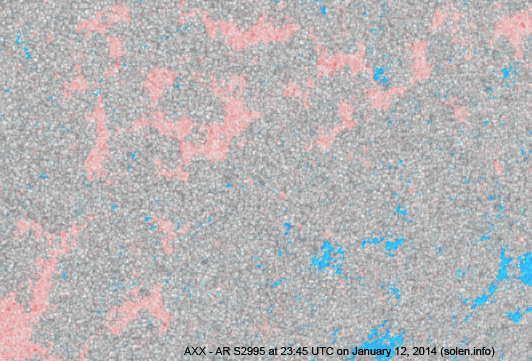 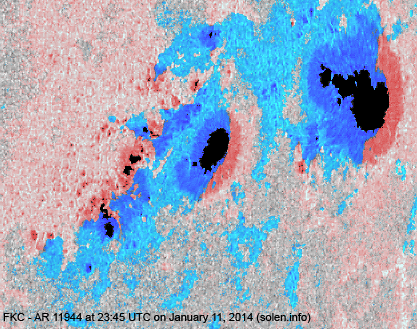 A filament eruption was observed in the northeast quadrant from 10h UTC. 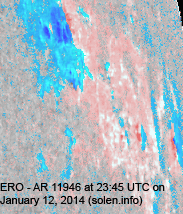 The associated CME does not appear to have any Earth directed extensions. 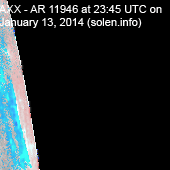 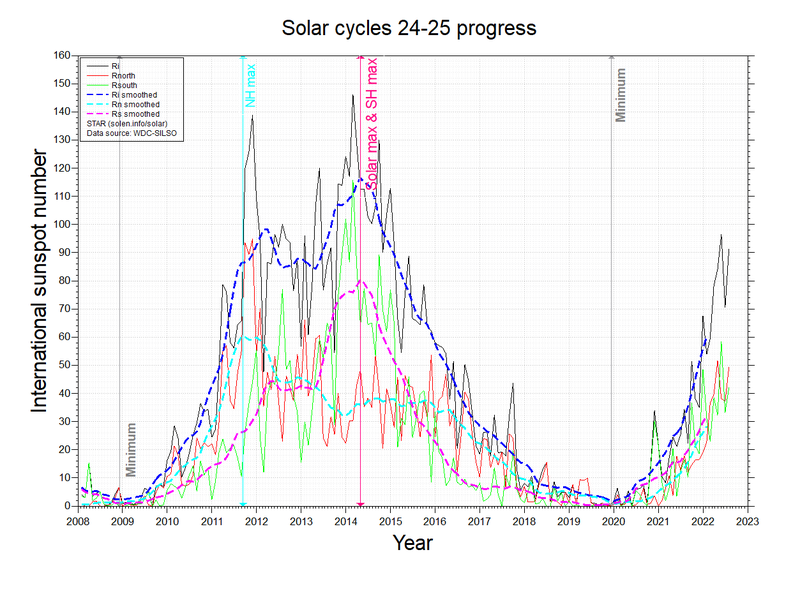 January 11-13: No obviously Earth directed CMEs were observed in LASCO and STEREO imagery. 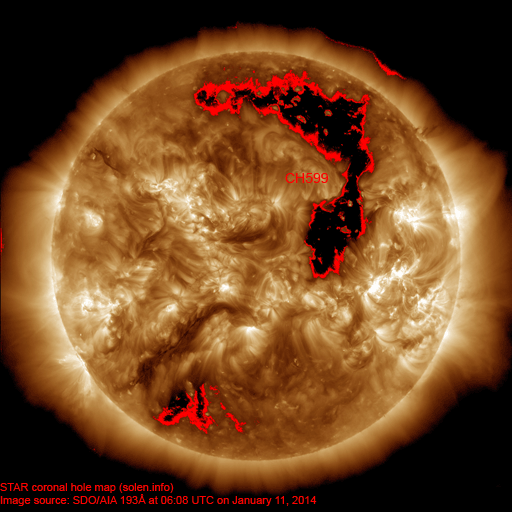 The geomagnetic field is expected to be quiet to active on January 14 due to effects from CH599. 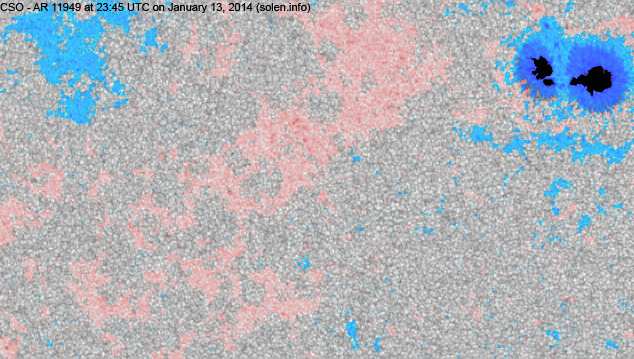 Quiet conditions are likely on January 15-17.